Section 184 HUD housing is a loan guarantee program that Congress established to help American Indian and Alaska Native families become homeowners. It provides low downpayment mortgages to borrowers in addition to a repayment guarantee to lenders. The United States government holds much of the Indian tribal lands in trust for the benefit of particular Indian tribes. This land cannot be mortgaged or foreclosed upon, so lenders were largely unwilling to lend money to American Indians and Alaska Natives for them to purchase, refinance, construct, or remodel their home. Congress passed the Section 184 Indian Home Loan Program in 1992 to help Native American individuals, families and tribes purchase and repair homes on their native land. This loan program was designed by the United States Department of Housing and Urban Development (HUD) to provide funding opportunities to Native Americans who often had trouble finding the mortgage loan they needed to buy a home or make repairs on their homes. Specially trained HUD underwriters and loan specialists understand the unique issues faced by Native Americans who want to get a loan to purchase or fix up their home. These specialists work with local lenders to create loan programs and loan products. Under the Section 184 program, the borrower will lease the land from the tribe. The lease will be approved by the Bureau of Indian Affairs and by HUD. The home and the lease in the home site are mortgaged. This means that in the event of a foreclosure the home and home site lease are foreclosed, not the land. The ownership of the land remains in trust for the tribe. If the land is in an Indian area or Alaska Indian area, but is not held in trust, this guarantee program can still be used. With this program the borrower works with a local mortgage lender who in turn works with a HUD expert trained in this program. HUD has approved lenders throughout the United States to offer this specific loan. Loan Application - The borrower contacts a local HUD-approved Section 184 lender and completes a mortgage loan application. Local Lender Review - The lender reviews the mortgage loan application, the borrower's financial situation, and arranges for an appraisal of the property using the same loan review process as other mortgage loans. The lender will also work with the borrower to obtain documentation that shows the status of the land and to complete the Indian Loan Guarantee Certificate (HUD Form 53039). Regional HUD Review - If the local lender thinks the borrower should be approved, they send the loan information, land status documentation, and HUD Form 53039 to HUD for review. Borrower Pays Special Fee - The borrower is charged a 1% loan guarantee fee at closing if HUD approves the loan to be included in the program. 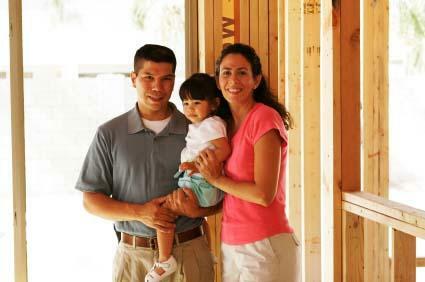 HUD Guarantees Loan - HUD guarantees each mortgage loan that is made to eligible borrowers. The lender is reimbursed by HUD if the borrower forecloses on the loan. Your lender can give you more details about the Section 184 HUD housing program. Information is also available online from HUD..